LEXINGTON, Ky. (October 20, 2009) − To celebrate and honor the accomplishments of University of Kentucky College of Medicine alumni, awards were presented to notable graduates at the UK Medical Alumni Association's Distinguished Alumni Awards dinner on Friday, Oct.16, at Spindletop Hall in Lexington, Ky. These esteemed alumni have demonstrated exemplary service and leadership in areas related to the field of medicine. Dr. Fred Edwards, a 1979 UK College of Medicine graduate, received the Distinguished Alumnus Award for his accomplishments in and commitment to academic medicine. This honor recognizes graduates of the medical school or residency program who have achieved a high level of distinction in their careers and have focused their efforts on the educational experience of medical students, residents, interns and/or fellows. Originally from Madisonville, Ky., Edwards received his bachelor's degree from United States Military Academy at West Point and completed his master's degree from Georgia Institute of Technology. Edwards received his general surgical training at the Eisenhower Army Medical Center and completed his thoracic surgery training at Walter Reed Army Medical Center. He is currently professor of Surgery and is the chief of the Division of Cardiothoracic Surgery at the University of Florida College of Medicine-Jacksonville. As chairman of the National Cardiothoracic Surgery Database for The Society of Thoracic Surgeons, he directs one of the largest clinical databases in the world. He also is vice-chairman of the American College of Surgeons, Surgical Quality Alliance and serves on the Executive Committee of the AMA Physician Consortium for Performance Improvement. In 2009 he was appointed to the editorial board of The Annals of Thoracic Surgery, and in 2007 he received The Society of Thoracic Surgeons Distinguished Service Award, which is the highest award given by this professional organization. Edwards lives in Jacksonville, Fla.
Dr. Leonard G. Gomella, a 1980 College of Medicine graduate, received the Distinguished Alumnus Award for his accomplishments in and commitment to academic medicine. This honor recognizes graduates of the medical school or residency program who have achieved a high level of distinction in their careers and have focused their efforts on the educational experience of medical students, residents, interns and/or fellows. Originally from New York, Gomella completed his medical school, general surgery and urology residency training at UK. Currently the Bernard W. Godwin Jr. Professor of Prostate Cancer and chairman of the Department of Urology at Jefferson Medical College, Gomella completed his urologic oncology fellowship in the Surgery Branch of the National Cancer Institute in Bethesda, Md., in 1988. Gomella currently serves as associate director of the Jefferson Kimmel Cancer Center, clinical director of the Jefferson Kimmel Cancer Center Network and urology chair for the Radiation Therapy Oncology Group (RTOG). He has given more than 400 presentations at local, national and international meetings and written over 300 papers, chapters and monographs in the field of urology. Author and editor of more than 50 editions of 17 different books, Gomella is known for the "Clinician's Pocket Reference," a widely used reference for medical students and health care providers that is now in its 11th edition. This book is based on a program developed at UK and is given as a gift to every UK medical student. Gomella has been included on lists of Best Doctors in America, Top Doctors for Cancer, Philadelphia Magazine's Top Doctors and Men's Health Magazine's top 20 urologists in the United States. In addition, he has served as president of the Mid-Atlantic Section of the American Urological Association and was elected to membership in the American Association of Genitourinary Surgeons. Gomella lives in Chadds Ford, Pa., with his wife Dr. Tricia Gomella, also a UK graduate, and their four children. Dr. Perry Grigsby, a 1982 graduate of the UK College of Medicine, will receive the Distinguished Alumnus Award for his commitment to research and innovation. This honor recognizes graduates of the medical school or residency program who have achieved a high level of distinction in their careers and have demonstrated leadership resulting in significant contributions to scientific research, medical treatment and/or advances in patient care or medical technology. Originally from Cadiz, Ky., Grigsby received his bachelor's, master's, and medical degrees from UK and completed his residency at Washington University's Mallinckrodt Institute of Radiology, located in St. Louis, Mo., later becoming chief resident. During his residency, Grigsby was the recipient of a National Research Service Award from the National Institutes of Health, the Physicians Recognition Award from the American Medical Association and named outstanding student in radiation therapy. He also completed his master’s of business administration degree at Washington University in St. Louis. Currently, Grigsby serves as professor of Nuclear Medicine, Radiation Oncology, and Obstetrics and Gynecology at Washington University School of Medicine. He is director of the Brachytherapy and microRT Treatment Center at the Mallinckrodt Institute of Radiology. His NIH-funded research focuses on the use of molecular imaging for the diagnosis, treatment, and molecular pathway analysis of cervical cancer. He is author of more than 300 peer-reviewed and invited manuscripts and book chapters and a co-inventor of a device called microRT, which is used in radiation research. Grigsby is an elected fellow of the American College of Radiology, an honorary member of the Chicago Radiological Society, and serves on national committees for the American Brachytherapy Society, the American College of Radiology, the American Joint Committee on Cancer and the American Society of Clinical Oncology. He has been awarded “Teacher of the Year” by the Association of Radiation Oncology Residents on numerous occasions. Grigsby has been included on lists of The Best Doctors in St. Louis and Best Doctors in America. He lives in St. Louis, Mo. Dr. Ellsworth Seeley received the Honorary Alumnus Award. This award honors individuals who have exemplified a dedication to medical education and residency/fellowship training and served as models of physician responsibility to patients, colleagues and community members, leaving a legacy at the University of Kentucky College of Medicine. Seeley earned his medical degree from the University of Louisville, in Louisville, Ky., and completed a rotating internship at Duval Medical Center in Jacksonville, Fla. He joined UK’s faculty in 1975 after spending 25 years in private practice. Seeley served as program director, vice-chairman and clinic director, prior to his retirement from the Department of Family and Community Medicine. In these positions he taught medical students many skills relating to “bed-side” manner and practice management. Since his retirement, Seeley continues to give back to the college by serving on the admissions committee, and precepting in the Department of Family and Community Medicine. Seeley is a past president of the Kentucky Academy of Family Physicians, and charter diplomat with three recertifications by the American Board of Family Medicine. He was honored by UK College of Medicine's 1990 graduating residents by the creation of an award in his honor to the best resident teacher, the E.C. Seeley Resident Teacher of the Year Award. 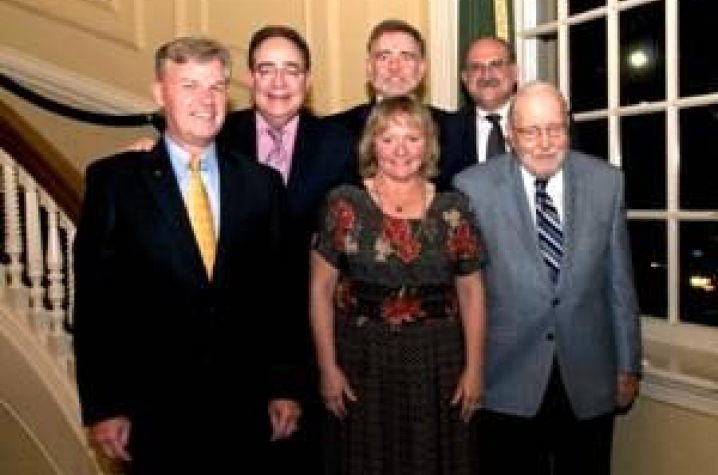 In 2009, Seeley was recognized by the Kentucky Academy of Family Physicians as recipient of the Distinguished Service Award. He also was recognized as Part Time Teacher of the Year by the American Academy of Family Physicians and received the Abraham Flexner Outstanding Teacher award in the areas of leadership and administration; teaching, educational innovation and curriculum development; and faculty development. Seeley lives in Lexington, Ky.
Dr. Linda Wrede-Seaman, a 1981 UK College of Medicine graduate, received the Commonwealth Award. This award is given to exemplary alumni for contributions to and leadership in the field of medicine. Wrede-Seaman received a bachelor's degree from Vanderbilt University, located in Nashville, Tenn., and completed residency training at Harbor General-University of California, Los Angeles (UCLA) Medical Center. Wrede-Seaman is triple-boarded in family medicine, emergency medicine, and hospice and palliative medicine. She is known as an early pioneer in the field of palliative medicine, serving both as a board member and executive committee member with the American Academy of Hospice and Palliative Medicine. She has spent nearly two decades in active public speaking and policy development for improving an integrated management plan for better pain and other distressing symptoms common at end of life. She served as medical director of Yakima Neighborhood Health Services, Yakima’s only non-federally funded community health clinic and Providence’s Hospice of Yakima in Yakima, Wash. Past experiences led Wrede-Seaman and her physician husband to establish a medical publishing company , Intellicard, Inc., which has produced several practical guides for the development of the field, “Symptom Management Algorithms: A Handbook for Palliative Care,” now in its third edition, and “Pediatric Pain and Symptom Management Algorithms for Palliative Care.” With public concern of pandemic influenza, a 2009 new release guides patients and families and medical providers in handling minor to major symptoms of influenza, including guidelines for handling a death in the home. As a delegate to the Washington State Medical Association, Seaman has become a key member of the steering committee for the Washington State End of Life Consensus Coalition, focusing on quality end of life care, advocating through public speaking, consulting and policy change. She was recently appointed as an adjunct faculty for the new medical school, Pacific Northwest University to help develop a palliative care track. Celebrating its golden anniversary in 2010, the University of Kentucky College of Medicine has a nearly 50-year history of educating future physicians and scientists, discovering breakthrough medical research and treatment, and leading the Commonwealth of Kentucky in providing superior patient care.